This book may appear to be controversial and confrontational to some, yet it is very well-written and scholarly and covers an important subject. In recent decades, Christianity has made significant (one could even say impressive) inroads into Indian society, mainly at the expense of Hinduism. Indians often associate Christianity with the prosperity, progress and liberal values of the West. However this is erroneous, as most Westerners know, the West has progressed by throwing off the hold of Christianity in their society. Yet in India, Christian missions have cleverly manipulated this position to create a false perception. What Every Hindu Should Know about Christianity (Wilmington, Delaware, 2014) is a book by Kalavai Venkat, pen name of a computer scientist living in Silicon Valley but originating in Kanchipuram, India. To Hindus it might be meaningful to know that he is a “Tambram”, a Tamil Brahmin. His mother tongue is Tamil, but he is also at home in Sanskrit, Hindi and English. Having worked in Israel for years, he also knows some Hebrew, which is an unusual advantage over most Indians dabbling in Biblical Studies. But his chief competence is science, and this outlook contributes more and more to our understanding of how Christianity came about and why it still persists. An important new contribution, already familiar to Western specialists but much less to the Hindu layman, is psychology. Many Christian beliefs and practises, as well as the reflexes of the Christian apologists, are explained by such concepts as “confirmation bias”, “cognitive dissonance” and “selective attention”, the findings of evolutionary biology (which finds traces of morality even among the higher animals, independent from any divine revelation of the Ten Commandments) and the notion “meme”. These factors explain the Christian superiority feeling and anti-Hindu animus a lot better than the imperialist conspiracies or the sheer money factor to which many argumentative Hindus reduce the missionary offensive. While some American Protestant missionaries can make a career by harvesting souls in India for some years, most missionaries in the past and even today have made a lot of sacrifices for the joy of converting Pagans to the true faith. Some belief in their minds is stronger than any longing for pleasure and comforts. Sentimental people might deduce from this self-abnegation and strength of conviction that this conviction must be true. But while this belief is strong, indeed calculated to grab people by the throat and retain their loyalty to the death, it is also false. Kalavai Venkat bases his analysis on a thorough knowledge of the relevant literature, but first of all on a close reading of the source material, starting with the Bible. Most Hindus would already be disabused of their illusions about Christianity if they simply read the Bible, rather than the syrupy pamphlets of the missionaries. Since the 18th century, freethinkers have collected all the contradictions and absurdities in the Bible. Christian apologists tend to dismiss these sceptics as “village atheists” and pretend that there is a more sophisticated angle from which all these anomalies suddenly become logical. But this author clearly hasn’t found it, and isn’t convinced of its existence. Thus, it is undeniable that Jesus predicted his own Second Coming in the End-Time for within the lifetime of his listeners. On this simple prediction, which in his case required nothing more than looking up this momentous date in his very own agenda, God Incarnate managed to get it wrong. Some people may call it unsportsmanlike and unreligious to bring up this obvious defect, but hey, it is there is the Gospel in cold print. Should we not believe in the Bible anymore? When so many human beings do make accurate predictions, should we not expect some reliability from God himself? There are also elements in the Bible which modern sensibilities would find unpalatable. Thus, the Old Testament law requires a groom who finds that his bride is not a virgin anymore, to take her to her father’s doorstep and stone her to death. Similarly, a witch or a homosexual should be executed; God himself orders it. Now, Christians will tell you that this doesn’t apply anymore in the “Second Covenant”, i.e. Christianity (Judaism being the “First Covenant”), and that Jesus specifically prevented the stoning of an adulterous woman. Fine, but the author points out that Jesus explicitly professes his loyalty to the First Covenant and the totality of the Mosaic law. It is only with Saint Paul that a break with the Jewish law is effected. If Jesus prevented the stoning of a woman who by law deserved to be stoned, he was not law-observant and told a brazen-faced lie when he proclaimed his attachment to the totality of the law. Another possibility is that the story of Jesus and the adulterous woman was made up later as an illustration of the new Pauline view, which threw open the initially Jewish sect called Christianity to the Pagans. Paul did away with the law, and as an illustration of this reform, Jesus is posthumously turned into an enlightened skeptic of the law. All this is on the assumption that Jesus and Paul existed at all. The author devotes a lot of pages to this question, which has occupied many scholars. Many motifs are just general and appear in the hagiographies of other divine or extraordinary persons. In Herod persecuting the infant Jesus and trying to kill him, Hindus will recognize a similar episode in the babe Krishna’s life. Indeed, religion-founding myths have a way of travelling. Thus, we know how Moses’ story of being found after surviving as an infant in a little boat was copied from a story about king Sargon of Akkad, nearly a thousand years older; or that Noah’s Flood story was copied from the Gilgamesh epic. The Bible is not unique, it is but an evolute of many existing stories, upon which a new theology was superimposed. But some elements in Jesus’ story point to the existence of an individual, a travelling healer who shared the apocalyptic beliefs of his environment. Elements like the delusion that he was the expected Messiah, or that he suffered the Roman punishment of execution, may well be true. So, most likely we have a historical core with a mythological overlay, adapted by the evolving Church depending on its changing political and theological interests. As for Paul, doubting his existence is much less common, but the author summarizing the scholarly arguments for both positions without really deciding. A problem here is that Biblical scholarship is still mostly practised by Christian institutes. A truly historical and scientific approach is still very minoritarian. The author advocates a straightforward attack on the Christian core beliefs. No diplomacy, no appeasement, no inculturation, as so many other Hindus practise and advocate. Ridiculing Hindu “idolatry” and “polytheism” in the colonial period made the Brahmo Samaj, Arya Samaj and informally numerous anglicized Hindus make the improbable claim that they were iconoclastic monotheists. If you hear these Hindus talk about “God”, you might think you are among Evangelicals, so deep has the imitation gone. This proves that ridicule really works. Similarly, but more truthfully: if the many absurdities and contradictions in Christianity become better known, Hindus will turn away from it and even born Christians will disown the typical beliefs of Christianity. Among the sources of inspiration he lists, the writer mentions my own book, Psychology of Prophetism: a Secular Look at the Bible (Voice of India, Delhi 1995). I wrote that book because I was exasperated at seeing what silly myths numerous Hindus tend to cherish concerning Christianity and specifically concerning the person of Jesus: he was a guru, he had been to India, his “real” teaching included reincarnation, etc. It was by no means comprehensive and had only modest ambitions, but it seemed to me that it was urgently needed to convey to the Hindu public a glimpse of the scholarly and psychological knowledge recently built up about Christianity’s founding myth. Of course, with a mere book, distributed by a marginal publisher, I could not hope to make much of a difference. But seeing that twenty years later it has contributed to the present book, more thorough and fully accounting for the advances that science has made since, I am happy at seeing my effort amply rewarded. At the time I had befriended the late Dr. Herman Somers, an apostate ex-Jesuit known among Jesuits as “Doctor Triplex” because he had doctorates in Theology, Classical Studies and Psychology, besides an MA in Thomist Philosophy. He drew my attention to the work that psychologists had done about the Biblical prophets and the character of Jesus over the preceding century. He himself had written two books on the subject, in Dutch (given all his other knowledge, his active command of English was, like among most continental Europeans of his generation, rather poor). This line of research had led to the insight that Jesus had been a disturbed personality. In the middle of adapted myths and man’s natural tendency to religious imaginings, his own personal delusions had partly determined the specific contents of Christianity. At this point, I can reveal that the book was purposely incomplete. I had intended to add a chapter on a subject quite unknown to Somers, viz. Mohammed. My venerated publisher Sita Ram Goel dissuaded me from going ahead with this, as it was likely to provoke Muslim violence, which would only be contained after it had already done its damage. Years later I did publish a paper on the psychopathology of Mohammed as known through the Islamic sources (i.e. putting in parenthesis the emerging theory that he hadn’t even existed), but because of its unassuming channel of publication and its scholarly title (Wahi, the Supernatural Basis of Islam), it didn’t ruffle any feathers. Meanwhile, the internet has made similar theories about the Prophet, often by ex-Muslims, readily accessible to the Muslim public, so it can be (optimistically) hoped that this type of research may henceforth be done in all freedom. The book would have been sizable enough if it had limited itself to its chosen subject. However, the author has chosen to add a lengthy appendix about a seemingly unrelated topic, viz. the caste system. The reader should know something about the polemical context in India, essentially the same that diaspora Hindus in the West face. In the British period, the Hindus had to deal with attacks from the Churches on everything Hindu, including the caste system. Initially, neither the Churches nor the colonial authorities made a problem of the separateness and inequality inherent in caste. After all, both were familiar phenomena in Western society too, with the cleavage between noblemen and commoners, Christians and Jews, freemen and slaves, colonizers and natives, or the steep and compartmentalized class system in the British motherland. After the abolition of slavery, the anti-caste line of discourse was only one among many, typically brought up when addressing low-caste audiences. Today, it has become a monotonous but omnipresent refrain. Hindu-Christian “dialogues”, which the Christians prepare as publicity exercises and as psychological warfare, and where their naïve Hindu partners show up confused and unprepared, usually result in the embarrassment of the Hindus, who becomes hopelessly defensive when the inevitable subject of caste is raised. To set the record straight, the author draws upon his own personal experience, on his knowledge of the so-called law books of Hinduism, and on writings in Tamil and Sanskrit which would be inaccessible to many readers including diaspora Hindus. He confirms the obvious with the latest data from genetics: castes are biologically distinct units, identifiable subgroups of the human species. He slips, however, when he notes that these are biological groups “and therefore not human creations”. I guess he was not being careful in choosing his terminology here, for even biological groups are the result of the idiosyncrasies of human history. At any rate, the relations between the caste are a lot more nuanced as well as susceptible to change through the centuries. Thus, some untouchable castes had a glorious history and became only “impure” recently, during the Muslim or even the British period. The author demonstrates how, as per the law books they themselves composed, the Brahmins were barred from many pleasures and occupations, not quite how one would imagine a privileged caste. He also shows how the Christian meddling with the caste system objectively demeans rather than uplifts the low castes. This book is bound to reach the targeted Hindu public in substantial measure. That is has been written by one of their own, will certainly help, though the author’s American setting influences his take on the subject of Christianity. On the other hand, it is very much the need of the hour that Indian Hindus get to know the modern critique of Christianity rather than the silly syrupy views which secular politicians and moronic Babas feed them. 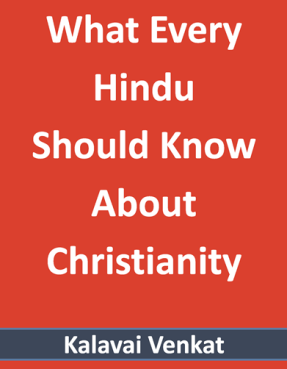 This book is really “what every Hindu should know about Christianity”.